Our modern life is awash with a confounding amount of choice, information and decisions on a daily basis. It’s easy to become overloaded and stressed, and for many we can opt unhealthy ways to numb the noise or seek to escape. This is where the profound and ancient practice of mantra can help. Increasingly the collective is reawakening to the wisdom of the power of our intention, thought and affirmation, how we hold our personal energy, and how this shapes our reality. The regular practice of chanting or japa, is a tool for self transformation. 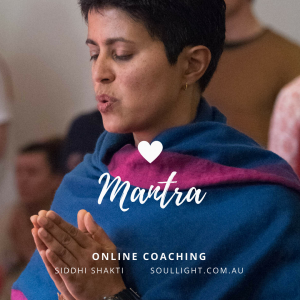 Mantra is an ancient practice of the repetition of high vibrational, sacred sound to attune us to Divine frequencies, transforming the essence of our ‘beingness’. It’s a means of focussing our thoughts, mind and energy to align with higher vibrations, the essence of energy of creation. I have been blessed with an affinity for and love of mantra, and initiated with special blessings from my teacher Shakti Durga. I’ve been on a journey of continuing refinement and deeply fortunate to have connected with guidance from Anandra George. It would be my great joy to share with you my love for the transformational power of sacred sound. Please connect with me either for a 1-1 coaching, or via one of the online programs I’ve recorded, should you be interested in learning some of the longer prayers, the suktas to Durga (courage), Lakshmi (abundance) and Saraswati (wisdom).